Hunter Douglas Architectural’s commitment to sustainability has led to HSBC’s new ring-fenced banking headquarters in Birmingham to become one of the greenest in the city. The HSBC UK building on Broad Street is the first in Birmingham to be constructed to the Leadership in Energy and Environmental Design (LEED) Gold accreditation standard – the globally recognised symbol of sustainability achievement. To attain the Gold LEED, the internal design was built using sustainable timber approved by the Forest Stewardship Council, which was sourced by Hunter Douglas Architectural. The international architectural products company supplied 600m2 of MDF grill finished in RAL9010 white. The panels, 25mm wide and 115mm in height, were manufactured with a 120mm gap to create a modern and light, aesthetically pleasing look for the space. 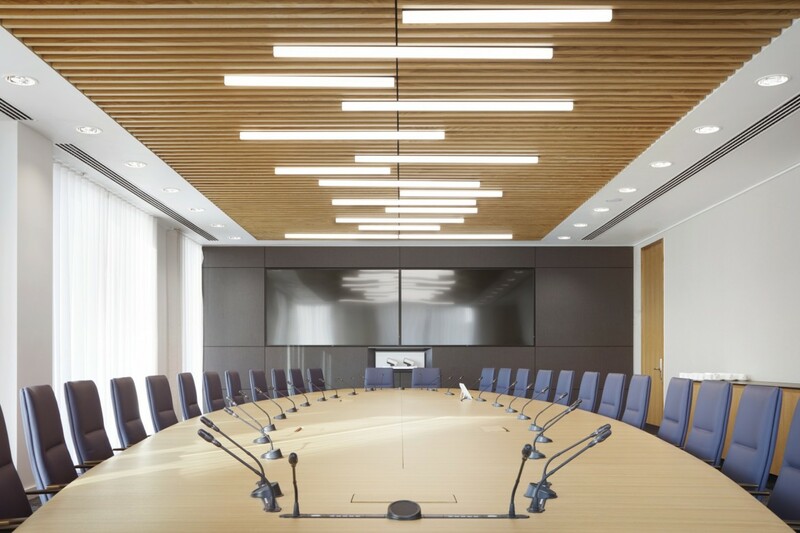 For the level 10 client meeting rooms, Hunter Douglas Architectural supplied 150m2 American White Oak veneered grill that was manufactured 39mm wide and 95mm deep, while for the HSBC University auditorium, it supplied 100m2 600 x 600mm of its Prestige American White Oak veneer panels. Acoustic control was achieved via the application of black non-woven acoustic fleece to the back of the panels and bespoke 9mm diameter holes in the panels. 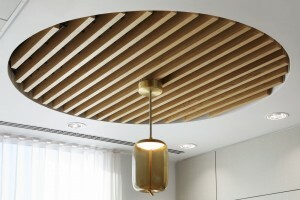 For more information on wooden grill ceilings please click here.